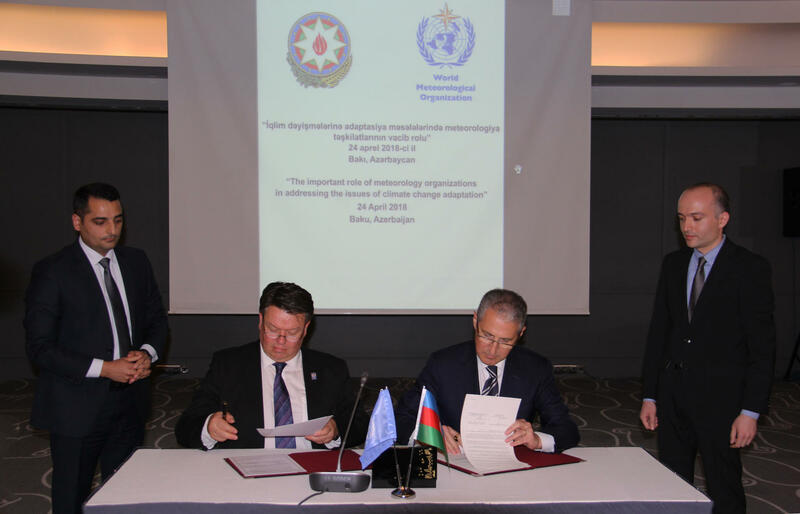 Azerbaijan’s Ecology and Natural Resources Ministry and the World Meteorological Organization (WMO) have signed a memorandum of understanding (MoU), the ministry said in a message. The document was signed as part of the “Important role of meteorology organizations in addressing the issues of climate change adaptation” conference organized by Azerbaijan’s Ecology and Natural Resources Ministry in Baku. The MoU was signed with the aim of strengthening the legal framework. Azerbaijan’s Minister of Ecology and Natural Resources Mukhtar Babayev, WMO Secretary General Petteri Taalas, the United Nations Development Program (UNDP) Resident Representative Ghulam Isaczai, head of the UN Food and Agricultural Organization’s (FAO) Partnership and Liaison Office in Azerbaijan Melek Cakmak and representatives of international organizations, government agencies, research institutes and non-governmental organizations took part in the conference.